Sugroth, Shield of Xivu Arath is a Hive Ogre seen in the first part of the Broken Courier mission. It was deployed by the Hive to defend stolen Awoken Artifacts after a successful raid on a temple. 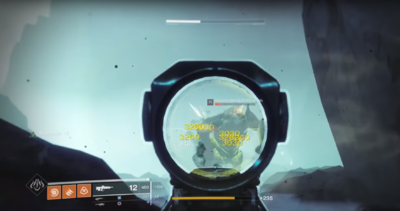 Sugroth will spawn after becoming near the first stolen Awoken artifact. It will damage the player with Void blasts until killed. Sugroth is the first entitled enemy belong to Xivu Arath's brood. Unintentional or not, Sugroth changes between rank, from a normal red-bar to a miniboss. Sugroth is the first boss of the mission Broken Courier.